Director Ron Howard delivers his finest effort with his extraordinary film, A BEAUTIFUL MIND, which won the Academy Award for Best Picture in 2001. Based loosely on Sylvia Nasar's acclaimed biography of mathematician John Forbes Nash, the film is a compelling look at one man's genius, his debilitating mental illness, and the fine line between the two. 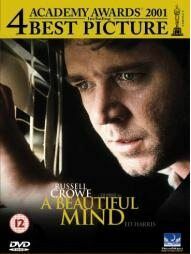 A BEAUTIFUL MIND begins with Nash (Russell Crowe) at Princeton, where he struggles to think of an original idea, and the stroke of genius that will make him matter. Nash is eccentric, socially awkward, and extremely competitive. Eventually, he finds the inspiration for his innovative and influential work on game theory. He's chosen for a post at MIT, which includes crucial code-breaking work for the US government. There, he meets a beautiful and brilliant student, Alicia (Jennifer Connelly). They marry but their happiness is threatened, as Nash, belatedly diagnosed as schizophrenic, descends into madness. Screenwriter Akiva Goldsman cannily condenses Nash's story, and the film manages to dramatize both Nash's mathematical brilliance and his schizophrenia in a compellingly visual manner. Crowe delivers a strong performance, and has real chemistry with Connelly. The two make the film's story about the power of love believable and moving.